Good Afternoon. 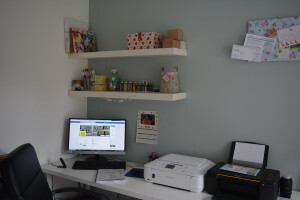 I’m currently sat in my (finally tidy) rearranged office, or as I like to call it, My Design Den. I’ve included some photographs for you to see! It will also be good for me to look back on and remember how tidy it can be. I don’t know why I don’t put things away more often, i’m just constantly using them so they get left out. People say messy work space – creative mind? I think i’ll go with that!!! So this is where I am when i’m responding to your messages, updating my social media accounts or creating those special frames. I’ve arranged my design den so it’s like a production line. Design it – Print it – Assemble it! I’m very lucky to have this large room at the back of our house. 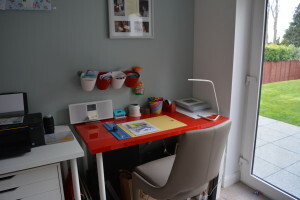 I’ve french doors to the right of the red desk that go out onto the garden, so i’m looking forward to summer and sitting with the breeze blowing in…and probably blowing my paper everywhere too…unless I put it away of course. I’m currently working on some product tags, they’ve been a great hit with business owners. They make a nice added touch to any finished product, there’s no point spending all that time creating something and then having it poorly wrapped is there? I like to make that extra effort with my frames that are dispatched and I love to receive items that have been packaged with love too. So I best get on with cutting them up….perhaps I’ll have some to show you on the next blog. That’s it from me for today! Have a great afternoon. Thank you Arlene, latest blog is now live and it’s all about those tags and stickers. Thank You Deb, i’m loving the new layout too, it’s working well so far!